This Heuer Autavia 2446C is an absolute eye-catcher and fascinates with its wonderfully preserved original condition. The "C" in reference number 2446C indicates the rare compressor case or snapback case. 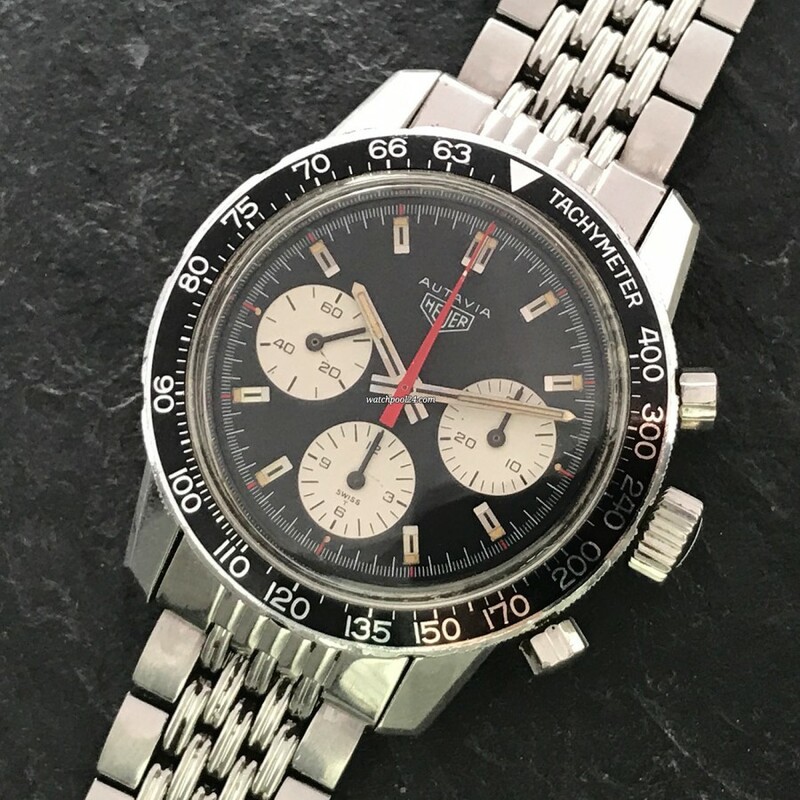 While the screw-back Autavia was manufactured for seven years and the caliber 11 and 12 models for impressive 16 years, the reference 2446C with the Valjoux 72 movement was only available from 1968 to 1971. The watch offered here has a beautiful black matte dial with white sub-dials (reverse panda dial) and red accents. The original luminous material is completely intact in the hands and hour markers. The large 40mm case has a condition most vintage collectors are searching for: it has natural signs of wear and is unpolished. The lugs are bevelled and show sharp edges. The rotating bezel with a tachymeter scale has been preserved without scratches. Mechanically, this Autavia offers every reason to be sought after. It is powered by the legendary manual wound movement Valjoux 72. The movement works perfectly and keeps accurate time. The chronograph starts, stops and resets as it should. Another highlight of this watch is the beautiful Gay Frères Double Rice stainless steel bracelet with a Heuer signed clasp. These rare bracelets themselves achieve high prices on the vintage watch market. Once an important tool of the Formula 1 racers, the Heuer Autavia is today one of the most sought-after cult vintage watches. Given the superior condition of the watch, its rarity and the attractive dial configuration, the present Heuer Autavia 2446C is a great opportunity for the collector of fine timepieces.